Mercedes-Benz has recenlty announced the Actros1, an edition specially designed for the UK market. Manufactured at only 100 pieces, this truck is sold since March 2018. The manufacturer promises future buyers that this exclusive model, equipped with the latest technologies, will be highly appreciated. The Actros1 has been designed to meet the specific needs of truck drivers. Efficient and reliable, this truck is very comfortable. In addition, to the detailled seats, Mercedes-Benz chose to equip this exclusive series with a spacious cab, a bed with a premium mattress and standard equipments (fridge, microwave...). This vehicle is made for long-distance haulage while saving the driver's strengths. In order to stand out and make the Actros1 a Mercedes-Benz pride, the manufacturer didn't hesitate to equip their new truck with the latest and best technologies. With the Safety Pack including the Brake Assist (ABA4), the Actros1 is able to reduce the risk of accidents with pedestrian recognition, danger identifications or automatic braking. This limited series is also equipped with the latest engine generation that helps save fuel up to 5%. 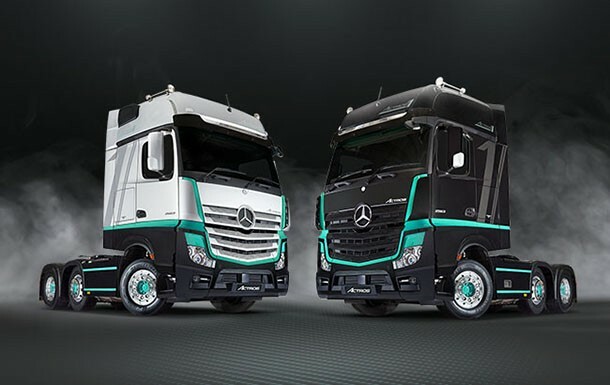 Finally, the Actros1 clearly showcases its modernity with an attractive design and a limitless connectivity (Bluetooth, GPS, radar, Customer Assistance,…). Developped exclusively for UK truck drivers, the Mercedes-Benz Actros1 is on the market since March 2018. You have to be quick to buy one of these vehicles. The Actros1 will only have 100 owners.